Suggestions on how to style HTML <select> or <input> elements with Bootstrap CSS classes onASP.NET MVC 5 views. This document was updated in February 2015. Here are our suggestions on how to style HTML <select> or <input> elements with Bootstrap CSS classes on ASP.NET MVC 5 views. Enclose the following in a div element, which is configured with a form-group class. In the enclosure, add a label element, configured with control-label and col-md-2 classes. Then, add another div element, configured with a col-md-10 class. Assume that “Size” is a simple collection of strings. The controller passes an object that has a SelectList property configured with this data. Use an HTML Helper, DropDownList. Use an HTML Helper, DropDownList. Yes, DropDownList. 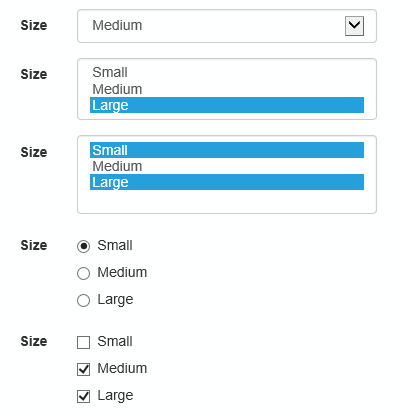 However, add a “size” HTML attribute. Use an HTML Helper, ListBox. The following will render a vertically-oriented radio button group. Enumerate through the collection. Enclose each <input type=radio… element in a div element, configured with a radio class. The following will render a vertically-oriented checkbox group (multi select). Enumerate through the collection. Enclose each <input type=radio… element in a div element, configured with a checkbox class.